2019 Winter training haul-ins dates announced! We're thrilled to welcome Yann Canedele back to Creekside Farm. 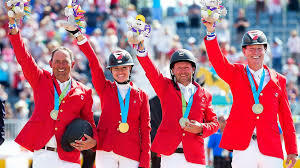 Yann's resume includes competing at Olympic, Pan American and World Equestrian Games. Yann was a member of multiple Nation's Cup winning teams and won four consecutive Canadian Show Jumping Championships titles. Yann will work with the horse/rider combination as a team and leave you with educational homework for the winter! This three-day clinic will run November 23rd, 24th, and 25th $700 plus GST for 3 days. Bring your horse and your coach to school your horse over a set course of jumper and hunter type jumps. One hour sessions, $50 per horse with a 5 horse maximum. Early Booking Discounts are here! All for contacts received and approved by December 1st, 2016! We are pleased to announce the availability of Joely Mann of Half-Steps at Creekside Farm. 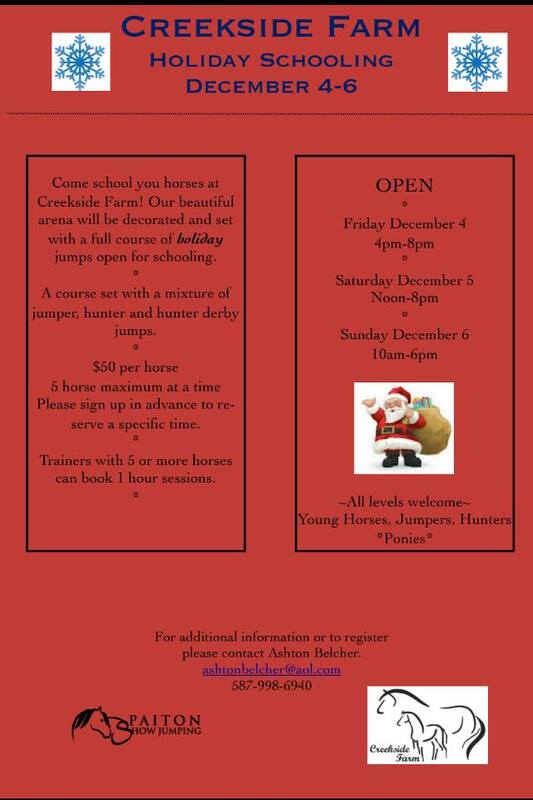 Due to popular demand we will be offering our haul-in schooling days the first weekend in December. 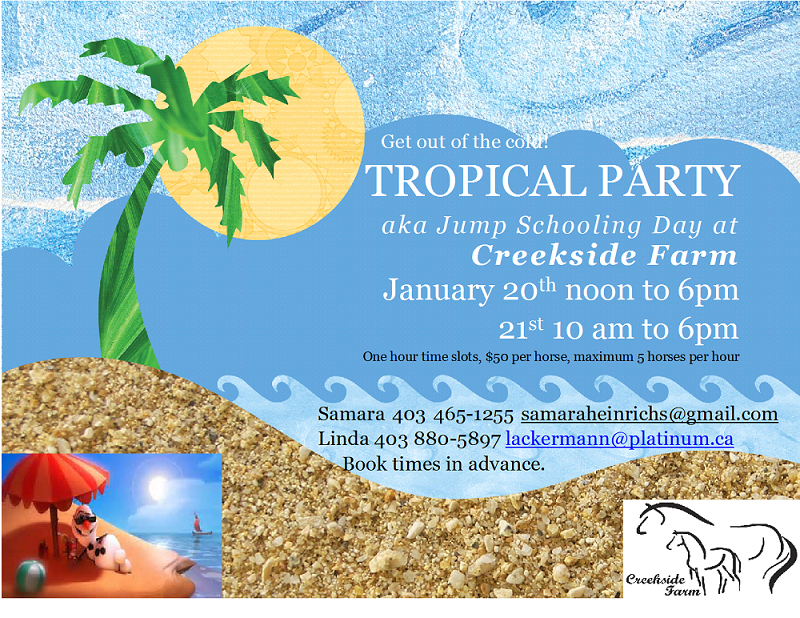 Creekside Farm recently launched a new riding lesson program following the Petit Trot program from the Alberta Equestrian Federation. Our Equine Canada certified instructors would love to discuss the options for your beginner, intermediate or advanced riders. Lesson packages available would make wonderful Christmas gifts! Creekside Farm is thrilled to announce a new addition to our Farm family. Contifax, a Contender son from the Ramiro line combines the best pedigree to what Creekside Farm offers. His friendly personality and kind temperment will be a fun addition to everyone here at Creekside. Contifax comes to us from an extensive career in Sport, competing up to the World Cup level. He is approved with Oldenburg, Westfalia, Rhineland and has been entered in the CSHA and CWHBA registries. Contifax already has offspring competing at the Grand Prix level! Watch for him this Spring in Western Canada. Get in touch with any breeding questions and for early booking and multiple mare discounts. 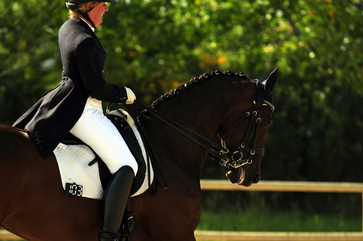 Creekside Farm is pleased to be welcoming Connie back to Calgary for a 2 day clinic the first weekend in June. Connie's clinics are known to build confidence in riders. She brings many years of coaching and judging experience with are and we're thilled to have her back a Creekside Farm. The clinic will offer times Saturday and/or Sunday. Food and refreshments will be provided. Creekside Farm is pleased to be welcoming Connie back to Calgary for a 2 day clinic at the end of January. Connie brings many years of experience coaching riders and training and inspecting horses throughout North America. The clinic will offer times on Friday afternoon and Saturday or Saturday and Sunday. Food and refreshments are included in clinic costs which are $250 + GST or $350 + GST including a stall for the weekend. Creekside Farm is proud to be hosting the inaugural CSHA Select Sale on September 10th, 2012. Some horses already arrived and potential bidders have been to Creekside Farm to try them. All horses will be here by Monday, September 3 in time for the completion of their vet checks and insurance exams on Tuesday September 4th. Wednesday, September 5th the horses will begin their demonstrations at Spruce Meadows during Breeds for the World in the riding hall. Come by and view your favorite horse while shopping at Spruce Meadows Equi-Fair. From Calgary take HWY 22 x West, 10 kms past Spruce Meadows. Turn rt/north at 160th Street. Go 2kms on 160th, farm on lf/west side of road. 146169 160th Street West. November 2011 Regardez is the top points earner for all Canadian Hunter Derbies. He was awarded Hi Point Derby Horse for both the Western Division and the National Division!! October 2011 Regardez Foals are eligible for NAKWPN papers and Register A Papers!!! September 2011 Grand Cherokee (Quality Time x Ikoon x Hamlet) just sold this week at the Limburgse Foal sale. A very impressive foal from a beautiful Ikoon mare still in europe. Prizelist and entry form now available for September 3 show. The winners from the young horse show at creekside. With a large turnout Creekside Farms Regardez topped the field with a 176 score! May 2011 Creekside Farm has had 3 foals in one weeks time! We now have foals on the ground by both resident stallions, Regardez and Ikoon. We have three stunning colts by Ikoon and one beautiful filly by Regardez. Thank you to Dr. Chris of Moore and Co. for helping this become a reality! At this time we just have one more foal by Bling that we are eagerly awaiting! Feel free to contact us for information and pricing on these foals. March 2011 Creekside Farm is please to announce the first foal of the season! Ikoon is the proud father of the little bay colt Grenache. Thank you again to Dr. Chris Brezowski of Moore and Company for making this possible. He is a full sibling to Cabernet who can be seen this week at Spruce Meadows Welcome Wednesdays. Creekside Farm is pleased to welcome John Turner again for a two-day horsemanship clinic that is sure to be fun for everyone. John has spent over 35 years both riding and coaching in the hunter and jumper rings with fantastic success over the those years. Auditors are welcome at $20.00 per day including lunch and feel free to contact us as there may be a few rider spots left. We are pleased to welcome Marion Ostmeyer to Creekside Farm once again. She will be available for coaching sessions. Please contact Linda at 403 880-5897 if you are interested. Marion is a Grand Prix rider in Germany and holds a teaching degree and a "Pferdeirtschaftmeister" (master’s degree allowing students to apprentice on her farm) from the University of Bielefeld. She also received the prestigious "Golden Riding Award" for 10 wins in classes of 1.40m or more from the German Federation. Here in Canada, Marion has shown successfully from Bromont to Spruce Meadows. Besides training and developing horses, teaching riders and matching horses with clients, Marion also teaches clinics around the world here in Canada, United States, Costa Rica and Hong Kong.